Blackened salmon salad is a delicious twist from ordinary tuna salad. 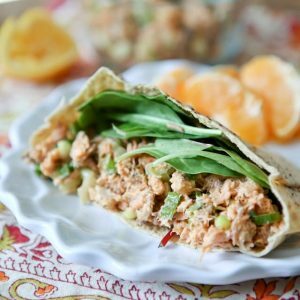 This easy salmon recipe makes a great addition to a tossed salad, or add to pita or whole grain bread to make a healthy lunch box sandwich. Place your cooked salmon in a bowl and gently flake using a fork. Add chopped celery and green onion. In a separate small bowl, mix together blackening seasoning, honey, mayonnaise, lemon juice, salt and pepper. Add to salmon mixture and gently stir to combine. Serve chilled in a pita, a roll or over a bed of greens. Make Ahead Tip: If you are already making salmon for dinner one night, cook up some extra and use it to make a salmon salad like this.